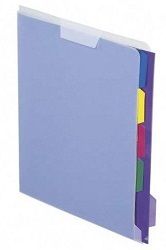 Made of super durable translucent polypropylene, project organizer includes five tabbed, removable pockets to organize all kinds of office, home-office and school projects. Top-loading title page holder with security tab. Ideal for traveling. Includes tab labels.